Abstraction that implements validation policy for Data and Interest packets. Definition at line 37 of file validation-policy.hpp. Definition at line 41 of file validation-policy.hpp. Multiple assignments of the inner policy will create a "chain" of linked policies. The inner policy from the latest invocation of setInnerPolicy will be at the bottom of the policy list. For example, sequence of this->setInnerPolicy(policy1) and this->setInnerPolicy(policy2), will result in this->m_innerPolicy == policy1, this->m_innerPolicy->m_innerPolicy == policy2', and this->m_innerPolicy->m_innerPolicy->m_innerPolicy == nullptr. std::invalid_argument exception, if innerPolicy is nullptr. Definition at line 30 of file validation-policy.cpp. Check if inner policy is set. Definition at line 67 of file validation-policy.hpp. If the inner policy was not set, behavior is undefined. Definition at line 49 of file validation-policy.cpp. Set validator to which the policy is associated. Definition at line 55 of file validation-policy.cpp. 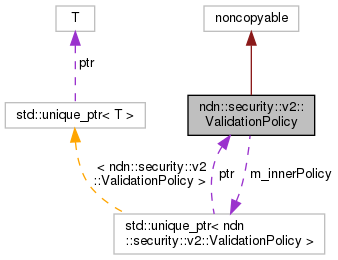 Implemented in ndn::security::v2::ValidationPolicyCommandInterest, nfd::CommandAuthenticatorValidationPolicy, ndn::security::v2::validator_config::ValidationPolicyConfig, ndn::security::v2::ValidationPolicyAcceptAll, and ndn::security::v2::ValidationPolicySimpleHierarchy. Referenced by ndn::security::v2::ValidationPolicyCommandInterest::checkPolicy(), and checkPolicy(). 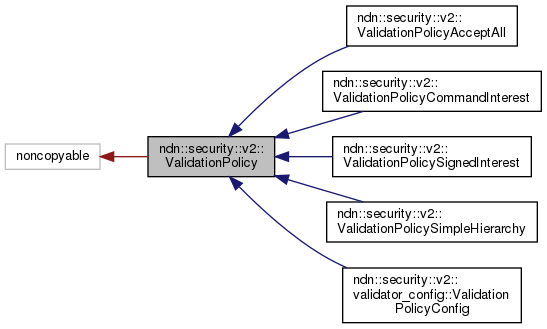 Implemented in ndn::security::v2::ValidationPolicyCommandInterest, ndn::security::v2::validator_config::ValidationPolicyConfig, nfd::CommandAuthenticatorValidationPolicy, ndn::security::v2::ValidationPolicyAcceptAll, and ndn::security::v2::ValidationPolicySimpleHierarchy. Check certificate against the policy. Unless overridden by the policy, this check defaults to checkPolicy(const Data&, ...). Definition at line 139 of file validation-policy.hpp. Definition at line 146 of file validation-policy.hpp. Definition at line 147 of file validation-policy.hpp. Referenced by getInnerPolicy(), hasInnerPolicy(), setInnerPolicy(), and setValidator().